The best fat burners from around the world—all in one product. 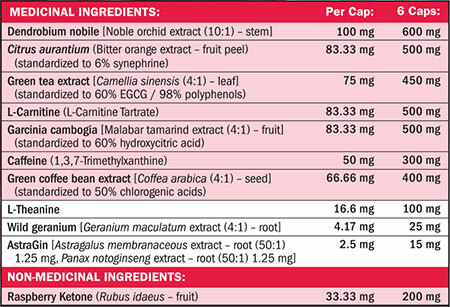 Extreme Fat Loss 8 Unique Ingredients. 1 Groundbreaking Formula. 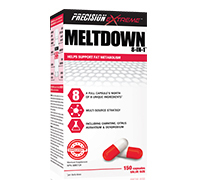 Meltdown 8-in-1 is a groundbreaking formula that fuses together a full, scientific dose of 8 powerhouse ingredients. No empty sizzle or ineffective fairy dusting—just straight fat blasting results. Meltdown 8 in 1 fuses together a full capsule’s worth of 8 unique ingredients into one ground breaking formula. OTHER NON-MEDICINAL INGREDIENTS: Capsule Shell (Gelatin, Purified Water), Magnesium Stearate, Microcrystalline Cellulose, Titanium Dioxide. RECOMMENDED USE: Helps support fat metabolism. Helps to (temporarily) relieve fatigue, to promote endurance, and to enhance motor performance. RECOMMENDED DOSE: (Adults) Take 3 capsules with breakfast and 3 capsules with lunch or dinner for a total of 6 capsules per day. (Not intended for persons under 18 years of age).